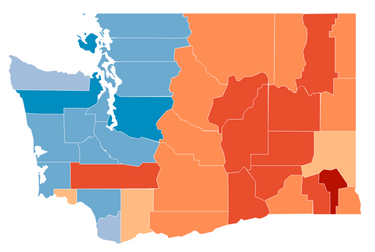 BEHIND THE VOTE | Washington state’s voting patterns have shifted over the past four decades, through 12 presidential elections. Eastside, Westside, red, blue. 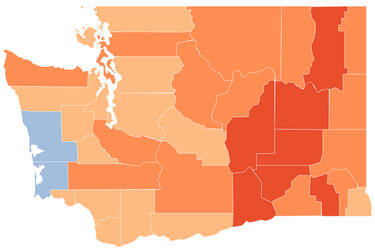 Rural, urban, wet, dry: Washington state has long lived these fundamental divisions. 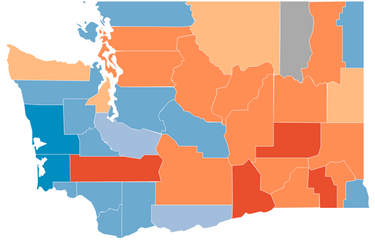 In the past generation, Washington voters have split in a schism harder than nature’s ragged Cascade divide. The state’s more rural counties east of the mountains have grown redder while the populous counties west of the divide have gotten bluer. 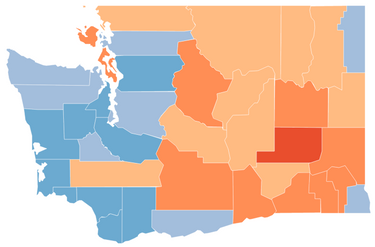 In Eastern Washington, only central Spokane has any Democratic state lawmakers left. Meanwhile, Seattle’s 7th Congressional District hasn’t elected a Republican since 1977. Results in presidential elections have followed a similar pattern. These divisions weren’t always so stark. Democrat Hubert Humphrey won Washington with just 47.2 percent of the vote, beating out Republican Richard Nixon and independent George Wallace. While a geographic divide was apparent as early as 1968, the lines began to blur in the 1970s and wouldn’t sharpen again until the early 2000s. Republican Richard Nixon won Washington with 56.9 percent of the vote. 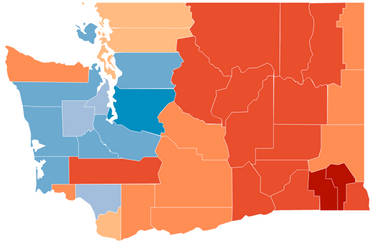 This electoral map is almost unrecognizable from today’s, with only two counties (Grays Harbor and Pacific) voting blue in 1972. The next year, John E. Cunningham became the last Republican elected to Seattle’s now overwhelmingly Democratic 7th Congressional District. 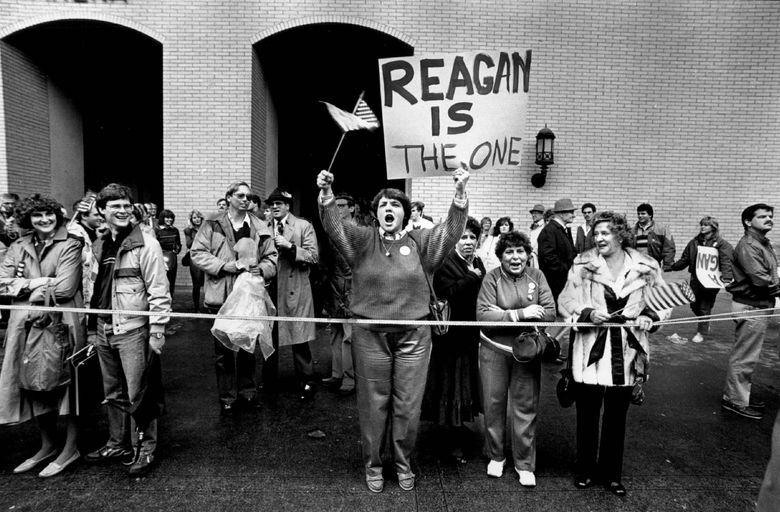 Republican Ronald Reagan won Washington with 49.7 percent of the vote, solidifying the GOP’s claim over the state. Republican Ronald Reagan won Washington again with 55.8 percent of the vote. However, times were changing; 1984 was the last year Washington voted red. Democrat Michael Dukakis won Washington with 50.1 percent of the vote, laying the groundwork for our current reputation as a blue state. Ferry County, in the northeast corner of the state, found itself in a neat tie, with Bush and Dukakis earning 972 votes each. Democrat Bill Clinton won Washington with only 43.4 percent of the vote. Independent candidate Ross Perot got 23.7 percent of the vote in Washington, siphoning votes away from both Clinton and Bush and posing a significant, if ultimately unsuccessful, challenge to the nation’s two-party system. This was also the last year that Democrats won congressional seats east of the mountains, with the re-elections of Spokane’s Tom Foley in the 5th Congressional District and future governor Jay Inslee, then living near Yakima, in the 4th Congressional District. Democrat Bill Clinton won Washington again with 49.8 percent of the vote. Despite Ross Perot’s third-party shake-up four years earlier, the major political parties were regaining their voter bases. Perot, running as the Reform party candidate, earned only 8.9 percent of the vote, a significant decline from his previous campaign. Democrat Al Gore won Washington with 50.2 percent of the vote, heralding the emergence of the state’s current geographic divide. 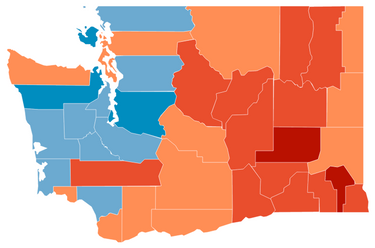 Voters east of the Cascades, especially in the southeast corner of the state, came out in strong support for the GOP, whereas voters west of the mountains, particularly in rapidly growing King County, continued to step up their backing for the Democratic Party. Democrat John Kerry won Washington with 52.8 percent of the vote. 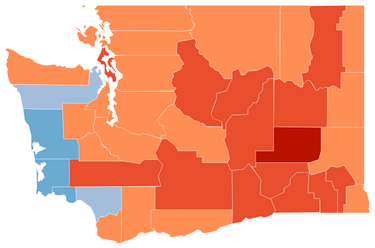 Political polarization continued, with red areas getting redder and blue areas getting bluer. Democrat Barack Obama won Washington with a resounding 57.7 percent of the vote. His victory was largely bolstered by strong support in King County, where Obama earned more than 70 percent of the vote. 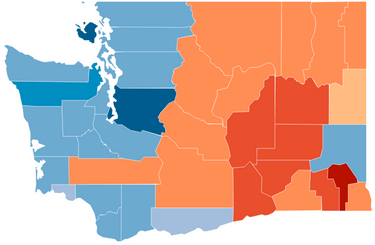 By 2008, almost one-third of Washington’s population lived in King County. Democrat Barack Obama won Washington again with 56.2 percent of the vote. 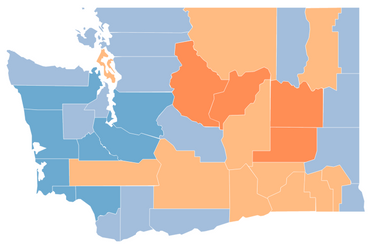 The state’s political divide was undeniable. 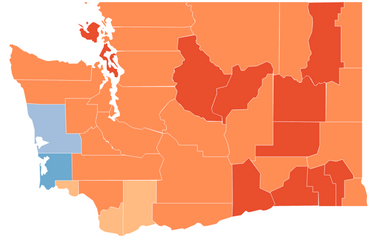 Lewis County remained the only county in Western Washington to have never voted blue over the past four decades. 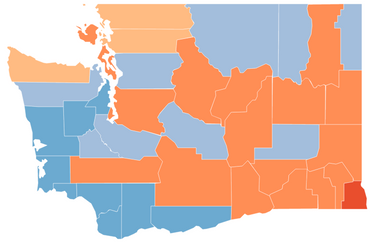 Several counties in Western Washington now drive the outcomes of statewide elections. 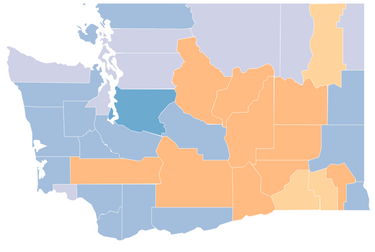 In fact, just three counties – King, Snohomish and Pierce – accounted for more than half the ballots cast in Washington’s 2012 general election. That dominance is unlikely to fade. With waves of tech workers swamping the Seattle area, and manufacturing and timber jobs continuing to wane throughout the state, Washington voters are witnessing a distinctly new political landscape taking hold. Seattle Times reporter Lynda V. Mapes contributed to this report. Audrey Carlsen: acarlsen@seattletimes.com; on Twitter: @audcarls.